While writing this, I'm in a plane somewhere above Iran, catching up to what happened in the rest of the world while I was at LCA 2011. And I am reading some weird stuff about Egypt. Their government took the Internet completely off line there. Funny, some USA senators wanted a kill-switch for the web. They've been taking cues from Iran and China lately when it comes to Freedom of Speech and how to deal with it, looks like they got another shining example of how to limit communication. Meanwhile, they are cracking down on Internet action group Anonymous. Interestingly enough, it's perfectly fine to demonstrate in front of the white house or block access to nuclear plants when they try to remove waste. If you do the same on the web, trying to defend freedom of speech (Wikileaks) they break in your house and take you, your family and any silicon-based device they can find. And they get away with it - as someone on osnews said: "[US citizens] wouldn't know it if aliens invaded and then simply took over. That would involve lifting their nose out of their kindle or iPad." Unfortunately, it ain't just the usual suspects China, USA, Korea & most of the middle east countries. I understand Australia (where I just came from) has also seen several arrests of Anonymous members. And to think that we just listened to a keynote by Mark Pesce talking about how we're way to much under control of governments and large companies like Facebook and we need to start working on Mesh Networking and things like that so nobody can take away our communication... I hope the keynote video goes live asap on blip.tv. Warning, some profanity in there! Further at the conference, some experiments were done with a mobile phone (yes, just a normal android phone) attached to a balloon, providing mesh networking over several kilometers (!!!). Seems like we have the tech - now the incentive has arrived too! I do see some bad sides of the little-too-extreme kind of transparency wikileaks promotes. And when I hear some people speak, I sometimes wonder if freedom of speech should be limited. But on the other hand - most of the things wikileaks has brought to light SHOULD have been brought to light. Their cables have already resulted in political fall-out in pretty much every country in the world (including my own Netherlands). And in a revolution which seems to be leading to more democracy in Tunesia, maybe in other countries too. And those who didn't know about these events are most likely either interested or will continue sticking their nose in their shiny new iPad. I'm not fond of self-censorship so I speak up. Still at Linux Conf Australia. Have new pictures, see below. Yesterday I attended talks about Koji (Red Hat build system) and Fedora. Koji - let's just say we need to communicate OBS a lot better. Will make the lives of many sysadmins quite a bit easier. Seriously, Koji is nice but: command line only (web interface just monitors and can restart tasks); runs on local hardware and thus only builds for your own architecture; doesn't really support building for other distro's - surely not Ubuntu and Debian like OBS can do; you can't just point it to a SVN or Git repository - no, first have to create source RPM's by hand. And there's more - just showing how awesome OBS really is. I do think OBS needs a name change - to something like Open Build Service. To make clear it ain't just openSUSE specific! The Fedora talk was also interested and the Fedora Project Lead is a cool dude. I spend some time with him during the Penguin Dinner and he invited me to a cross-distro discussion panel at FOSDEM together with the Debian project lead. We seem to be very much on the same page and I look greatly forward to that! 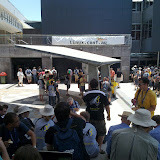 The Friday keynote by Mark Pesce was awesome, be sure to to check the video's on blip! There is an upload/network issue, so they won't be there anytime soon, unfortunately. He spoke about freedom, mesh networking, facebook and more. Oh and it's 18+ rated - including juicy quotes on Steve Jobs you don't want to miss! Of course the result will end up on the openSUSE marketing resources page here - I just need darix to upload it as the PDF is more than the 2 MB limit. I promised to write more about Linux Conf Australia. The good: great weather, great people, nice talks. The bad: little if any openSUSE presence; some people don't even know it and pretty much nobody has any idea bout awesome stuff like the Build Service, Studio, Tumbleweed etc etc. The ugly: no idea how to turn that around for now. So I need some help! To save you the searching, see the picture below. And yes, I am wearing the openSUSE t-shirt today - and there's more where that came from! A few days ago I posted about Canonical's decision to start shipping Qt with Ubuntu but do it in a not-exactly-cooperative way. Aaron replied to my post that he had contacted Mark who simply forwarded him to the Kubuntu developers. Mark either didn't get the point Aaron tried to make or didn't like it - either way, too bad. Luckily, at the cross-distro app installer meeting openSUSE organized, Ubuntu had two people over and it was even decided to use the Ubuntu Software center as reference for other distributions. Good to see Canonical seems open for collaboration - at least to some extend. After that meeting the Bretzn team worked for three days on an openSUSE appstore - count on an article about that soon! Hint: pretty awesome results in the pipeline and patches are already flowing in, implementing the ideas, plans and mockups from the meeting. I must say I'm really happy with those meetings and look forward to see what openSUSE will be doing over the next months on the app store front! Meanwhile I write this at LCA 2011 in Brisbane, Australia. For anyone who is curious: no, no swimming skills needed to get around. Some roads are still blocked here and there but I haven't seen any big problems. I know, pictures or it didn't happen - see below. I promise to blog more about LCA later! In May, the dutch "HCC" computerclub will organize a Linux day. They have asked me if I'd be willing to give a talk there - cool, I can do that. And if I could also set up and staff a booth. Slightly harder to do that on my own - so I hereby would like to ask any dutch openSUSE users who are willing to help out to contact me! Maybe we can do more than only that booth, there are plenty of events in the Netherlands and of course we should organize a openSUSE 11.4 release event to get to know each other! 2 days ago I wrote an enthusiastic blog about a cross-distribution collaboration meeting on App Stores we've organized in Nuremberg. Then, a day later, Canonical decided to ship Qt with Ubuntu. While not anything special from an openSUSE pov (we give both GTK and Qt equal treatment and offer the best platform to develop for both), it's a nice move. In the announcement Mark Shuttleworth emphasized Qt integration with Ubuntu. I specifically write Ubuntu, not GNOME/GTK - Aaron Seigo responded to that with a blog post showing a bit of frustration with Canonical's policy, the push for dconf & Ubuntu-specific Qt integration in apps. Now I'm as big a fan of a good KDE vs GNOME flamewar as anyone and maybe we make them more fun by introducing a GNOME/Ubuntu and Qt/Ubuntu set of apps (what seems to be going on since Mark announced Unity as default in Ubuntu). More splitting up = more fun, and openSUSE's tagline is 'have fun' so maybe we've been going at this all wrong. openSUSE has a focus on collaboration and integration. I happily wrote about the achievements at the openSUSE conference in that area in October. we worked with Red Hat, Mandriva, Debian. Over the last 3 days we had people from these and more distributions in Nuremberg to work on an app store spec for Linux. Then, right now a second sprint has started, to integrate appstore technology in openSUSE itself. Yes, 2 birds, one stone: first we discuss cooperation, then implement results. Now maybe Mark is right, creating a special Ubuntu world for application developers will create more fun. Or maybe we're right - letting the community do it's thing is more fun. I don't know. But if anyone is unhappy about Mark telling you what to do in Ubuntu, you're welcome here to help shape openSUSE how you want it! Which includes bringing Ayatana to openSUSE. Or MeeGo. And Mark, if you happen to hear Aaron and decide Canonical should cooperate a bit more with others, we're always open for that! LCA - here I come! On a more personal note, next week I'll attend Linux Conf Australia! Luckily the bad weather around Brisbane has not made it impossible for the conference to go ahead as scheduled. I am finalizing my registration right now and travel has been arranged. I'll be there with Graham Lauder, openoffice.org's contact in New Zealand and openSUSE fan. We'll man a booth at the Open Day on Saturday where anyone can look us up and learn more about openSUSE. So any openSUSE users and contributors in the area: come look us up! Oh and for everyone with a blog or other site: here you can find openSUSE 11.4 counters! I just heard from Vincent that the Cross-distro app installer meeting organized by openSUSE is in full swing. As Vincent wrote in his blog, the idea came up at the openSUSE conference. We should work on getting distributions on the same page when it comes to a Linux Appstore technology. Appstore API's have been in development for ages on linux so we have a strong base. The as the Open Collaboration Services we currently have on freedesktop.org are inspired by the GetHotNewStuff technology which was developed by Josef Spillner many years ago - KDE and GNOME have used this to deliver wallpapers and scripts to their users. After GHNS, two possible successors were developed - OCS, started by Frank Karlitschek, seems the de-facto standard now. It was adopted by Maemo and now by MeeGo for their appstore, openoffice.org supports it and of course the family of opendesktop.org series of sites including the popular gtk-apps.org, qt-apps.org, GNOME- and KDE-look.org are all accessible from this API. At the cross-distro appinstaller meeting which started this morning people from several distributions including Red Hat, Mandriva and Debian are discussing together how Linux should tackle this. Can we agree on a common technology shared between distributions and Desktops? Hopefully we can bring together the work on app install by Richard, the Software Center tech from Ubuntu and FD.o's Open Collaboration Services in a way that benefits all. I had a quick phone call with Frank who told me the meeting is very constructive and he hopes that the major distributions can agree on some kind of standard by the end of this week. That would be pretty awesome! The appstore sprint aims to bring people on the same page and will be followed by a Bretzn sprint for openSUSE. At the Bretzn sprint (also sponsored by openSUSE) the goal is to get something done: work on appstore integration in openSUSE, as well as smoothen the process of building and distributing an application for developers. Bretzn, first announced at the openSUSE conference in October, is almost ready for its first release. At the sprint, Pavol Rusnak, who developed a web based openSUSE Games store, will also be present - I hope he can make sure we also have a web-accessible store for openSUSE! While it is unsure if the work on Bretzn and the openSUSE appstore will make it into openSUSE 11.4, it is clear that openSUSE is pushing innovation and standardization in the Linux market. Not going all alone, but thinking and caring about the larger ecosystem - I think that is what separates a real community effort from a company pushing a corporate agenda. Bringing the right people with the right skills and the right ideas together is what these sprints are all about - I'm happy to have helped make it possible. And less happy that I couldn't be there myself, there is little in the world of Free Software that gives me more energy than being at a developer sprint! Good luck and Rock the Boat! Today is a busy day for openSUSE. The election committee is busy finishing the last bits and pieces needed for the election of two new openSUSE Board members to start. DigitITom just notified the openSUSE-project mailing list that voting is open and the voting site can be found on openSUSE connect! Where do we need to improve ? So plenty of activity, stay tuned and have fun!